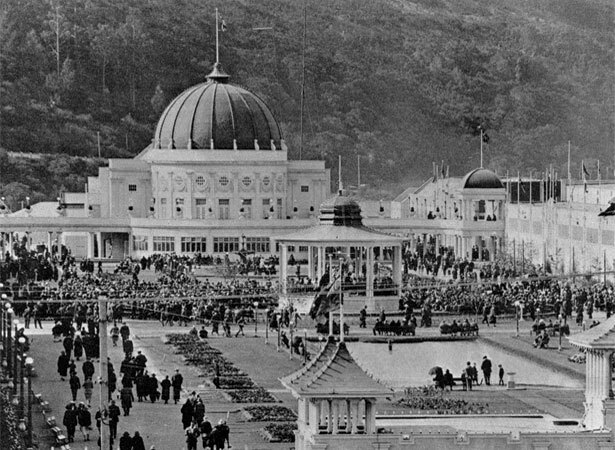 Governor-General Sir Charles Fergusson opened Dunedin’s New Zealand and South Seas International Exhibition in November 1925. By the time the exhibition closed in May 1926, it had attracted over 3.2 million visitors, more than double New Zealand’s total population at the time. Promoted by the Otago Expansion League in response to the population and economic drift north, the exhibition site was on reclaimed land at Lake Logan. Edmund Anscombe, the architect, designed seven pavilions linked by covered walkways around a grand court of reflecting pools leading to the domed Festival Hall. The buildings occupied approximately 16 acres (6½ ha). There was an art gallery, a fernery (with a waterfall and streams), and an amusement area with seven major rides and a fun factory featuring a large comic-face entrance. It appears people never tired of the exhibition in the 24 weeks it was running – the closing Saturday had a record attendance of 83,935. It would be a long wait for the next exhibition on a similar scale: the Centennial Exhibition held in Wellington, in 1939–40 (see 8 November). We have 4 biographies, 3 articles, related to New Zealand and South Seas International Exhibition opens .